The Federalist Papers , written in 1787-1789 by Alexander Hamilton, James Madison, and John Jay, was a series of essays, "written in favour of the New Constitution, as agreed upon by the Federal Convention on September 17, 1787." This formative document served as the basis to establish the infrastructure of a new nation's government, how it would be financed and defended, and clearly differentiated the roles of federal and state governments. 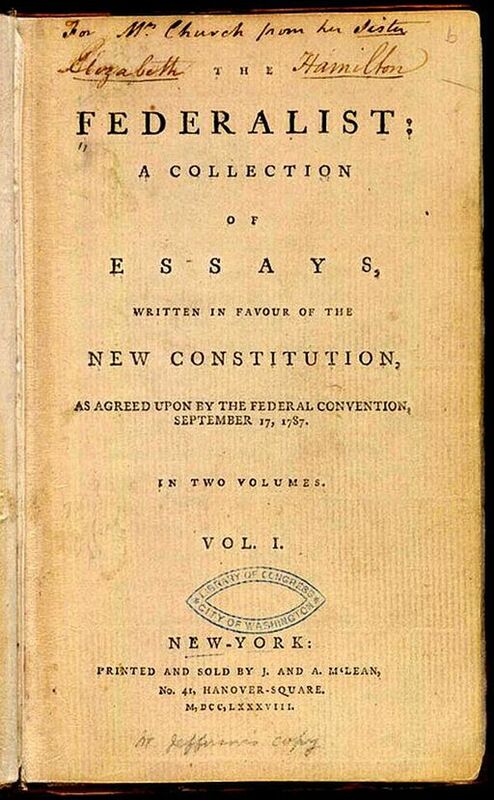 Before being published as a two volume set of books in 1789, the essays were printed in installments predominantly in New York periodicals, over a seven month period to communicate the nation's plan to its people. The Federalist Papers comprises eighty-five essays and is considered a vital reference document for the United States, next to The Declaration of Independence, United States Constitution, and its Amendments. An important part of our American History. Federalist No. 26: The Idea of Restraining the Legislative Authority in Regard to the Common Defense Considered. Federalist No. 37: Concerning the Difficulties of the Convention in Devising a Proper Form of Government. Federalist No. 38: The Same Subject Continued, and the Incoherence of the Objections to the New Plan Exposed. Federalist No. 40: On the Powers of the Convention to Form a Mixed Government Examined and Sustained. Federalist No. 45: The Alleged Danger From the Powers of the Union to the State Governments. Federalist No. 47: The Particular Structure of the New Government and the Distribution of Power Among Its Different Parts. Federalist No. 48: These Departments Should Not Be So Far Separated as to Have No Constitutional Control Over Each Other. Federalist No. 49: Method of Guarding Against the Encroachments of Any One Department of Government by Appealing to the People Through a Convention. Federalist No. 51: The Structure of the Government Must Furnish the Proper Checks and Balances Between the Different Departments. Federalist No. 57: The Alleged Tendency of the New Plan to Elevate the Few at the Expense of the Many Considered in Connection with Representation. Federalist No. 58: Objection That The Number of Members Will Not Be Augmented as the Progress of Population Demands. Federalist No. 66: Objections to the Power of the Senate To Set as a Court for Impeachments Further Considered. Federalist No. 72: The Same Subject Continued, and Re-Eligibility of the Executive Considered. Federalist No. 74: The Command of the Military and Naval Forces, and the Pardoning Power of the Executive. Federalist No. 77: The Appointing Power Continued and Other Powers of the Executive Considered. Federalist No. 81: The Judiciary Continued, and the Distribution of the Judicial Authority. Federalist No. 82: The Judiciary Continued. Federalist No. 84: Certain General and Miscellaneous Objections to the Constitution Considered and Answered. Return to the Alexander Hamilton library.